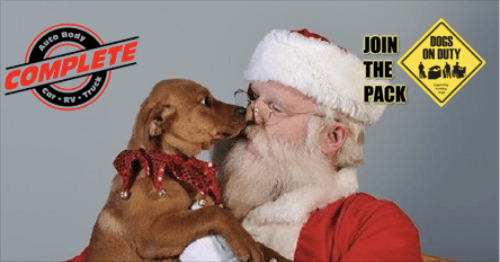 Bring Your pets dressed in their holiday best & help Benefit Dogs on Duty! What is Dogs On Duty? The main mission for DOGS ON DUTY is to provide support for all forms of working and service dogs. The working/service dog class has several members: police and guard dog, military and detection, search and rescue, service and guide (which include physical assistance, psychiatric assistance, medical alert, autism assistance and much more). Many of these dogs are owned and worked by individuals who have no means of fund raising when additional items are needed or emergencies occur. They give their time and effort to help others who need their services. DOGS ON DUTY fund raising is meant to fill that gap. The following situations are examples of when the funds would be used. Search and Rescue group called into action, DOGS ON DUTY provides gas card to cover the expense of the travel to the area needing the dog to search. Otherwise, the owner spends their money on gas, food, lodging and time off from work with no way of replacing it. K9 officer is purchased by small department through donations, DOGS ON DUTY provides funds to purchase Kevlar vest for K9 officer to keep investment safe while working. Family receives dog to help with Autistic child, family needs to go to additional training to benefit them and dog but they can’t afford to travel to training location, DOGS ON DUTY provides, for cost of travel. Military K9’s and handlers are often separated overseas and DOGS ON DUTY will donate money to aid in their reunion.